It was a balmy fall evening that welcomed the Eastlake Wolves (ranked 20th in the state) as they entered French Stadium to take on the Kentwood Conquerors (ranked 65th in the state). 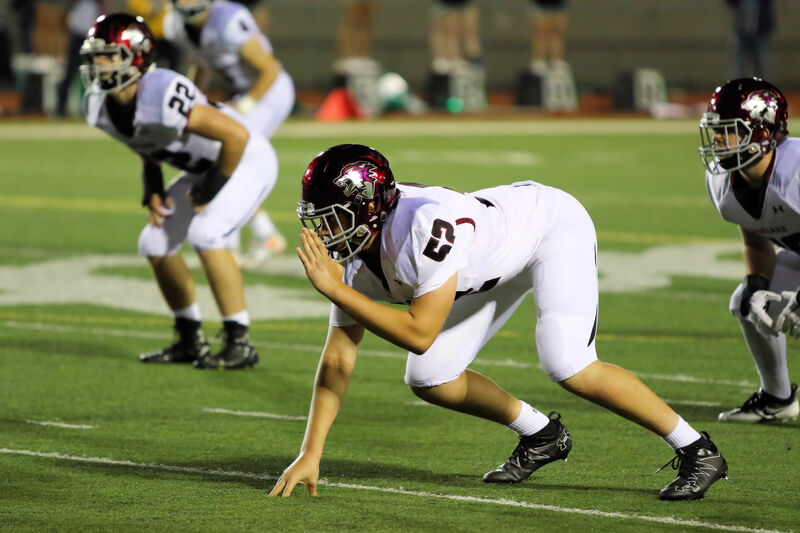 The Conks dominated their district with 7 wins to earn home field advantage for this first game of the regional playoffs with their 2 losses to Lake Washington School District teams (Woodinville and Skyline). The large cluster of Wolves’ fans who made the drive to Kent were cheering loudly as the Conks kicked off; Hunter Klinge received the ball and returned it for 20 yards. Daniel Bradley dominated the series with gains of 33 yards, 7 yards, and an 11-yard run into the end zone for the score. Taige Thornton kicked the extra point and the Wolves were up 7-0. 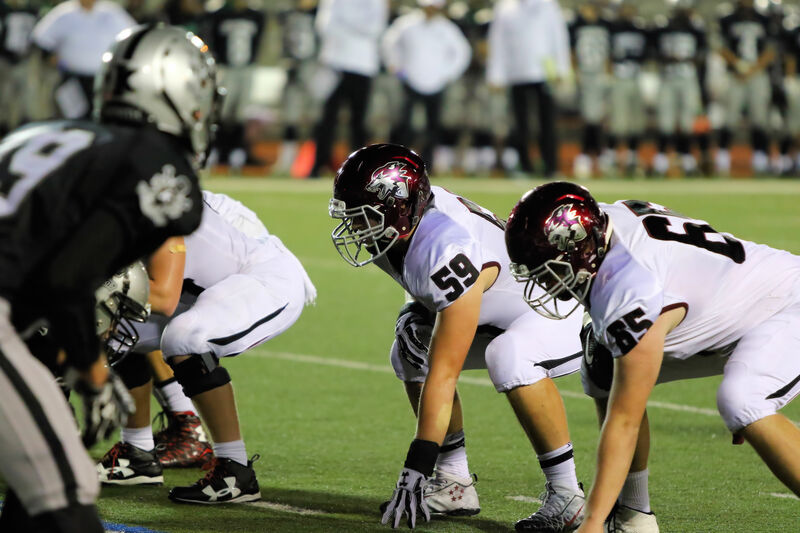 The Wolves defense dominated the Conks offense who punted on fourth down. The highlight involved Colin Booker who sacked the QB for a 2-yard loss. Bradley started the series off strong with nice gains, but fumbled a pitch that the Conks recovered. However, Noah Morse jumped on a Conks fumble on their second play of the drive. The Wolves quickly took charge as Cole Brinkman sprinted past his defender and caught a perfect pass from Ben Howard and then ran into the end zone. Thornton kicked the extra point and the scoreboard lit up the new score; 14-0. The Conks offense showed a spark life as they gained 22 yards on a run that was stopped by Hank Pladson. However, Booker took the wind out of their sails with another sack; this time for an 8 yard loss and the Conks were forced to punt again. The Wolves’ offense fired up their fans with a 63-yard gain by Klinge. 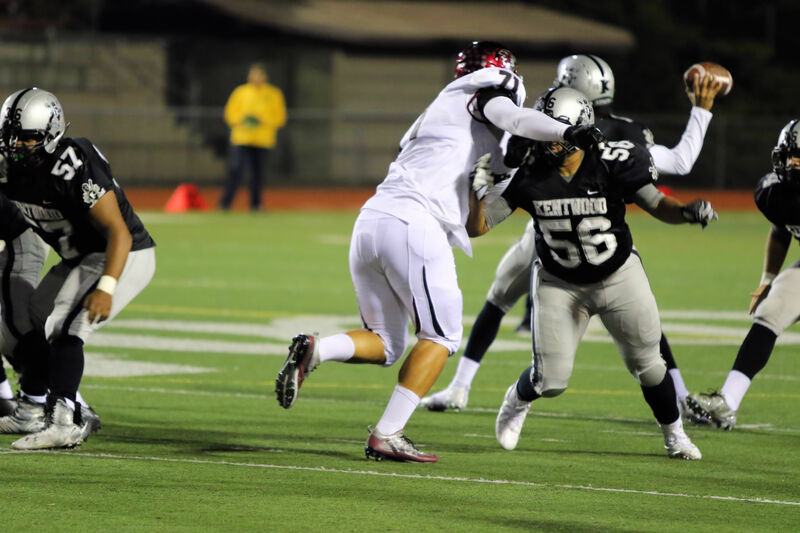 However, the Conks defense toughened up and sacked Eastlake’s QB for a ten yard loss and a play later the Wolves turned the ball over on downs. Booker continued his ferocious play and sacked their QB again for a 4-yard loss. Then, after an incomplete pass, the Conks punted. The Wolves offense was hitting on all cylinders as they marched down the field behind the powerful running of Bradley; 8, 11, 7, and 6 yard runs and a 10-pass reception. However, the Wolves turned the ball over again after a fumble. The Conks failed to get their offense moving and punted after a four down series including two penalties. The Wolves, starting on the 50 yard line, put together a successful series of plays including a 11 yard run by Bradley, 8 yard gain by Brinkman, a 26 yard QB keeper by Howard, and culminated with a 4 yard run by Bradley who scored. Thornton’s PAT attempt was good, and the Wolves were now up 21-0. Kentwood continued to struggle on the next drive and punted after two incomplete passes and punted to Eastlake. Eastlake surprised everyone when Cody Cox took a pitch, sprinted to the right, stopped and threw a pass to a wide open Brinkman who scored on the 64 yard pass reception. Thornton kicked his fourth PAT; the score was now 28-0. The Conks moved the ball down the field and looked as if they would score when Klinge intercepted a pass in their end zone. The Wolves took over and the half came to an end after a few snaps, 28 to 0 EHS. The Conks received the kick off to start the second half but the Wolves defense held them on 4th and 2; Kentwood turned the ball over on downs. 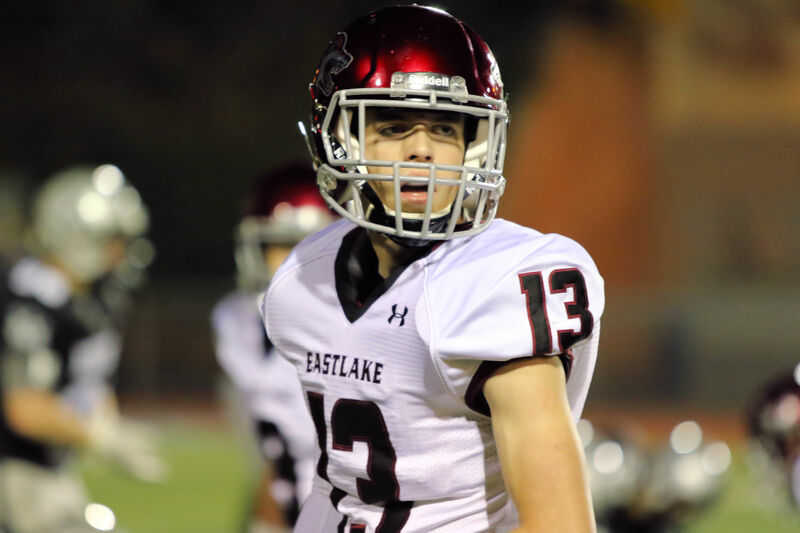 Eastlake continued to demonstrate why they are one of the top offenses in the state as they again moved the ball down the field and scored again. Notables on the drive included a 20-yard gain by Bradley and a 27-yard TD pass reception by Brinkman. Thornton kicked his fifth PAT to put the Wolves up 35-0. The Conks struggled again on offense and, after another Booker sack, punted the ball back to the Wolves. The next drive by the Wolves was sloppy but successful. The Wolves had a penalty, two 15+ yard passes broken up, and a snap sailed over the QB’s head for a 14 yard loss. However, Howard threw a 20-yard pass to Pladson for a TD reception. Thornton kicked his sixth PAT for the night and the score lead grew to 42-0. The Conks woes continued when on the next series resulted in another fumble recovered by Wolves lineman, Sam Milton. The Wolves, taking advantage of their substantial lead, opted to field their reinforcements. Jaxon Williams caught a 23 pass reception and freshman Garrett Carney had a successful series with gains of 7, 2, and on 4th down ran into the end zone for the score. The fans were jubilant for the freshman running back who was obviously thrilled. Thornton kicked his seventh PAT and earned the final points of the evening putting the Wolves up by 49 points. The Wolves, again fielded some of their up and coming team members to get them some game experience on defense; the Conks hoped to capitalize on this. 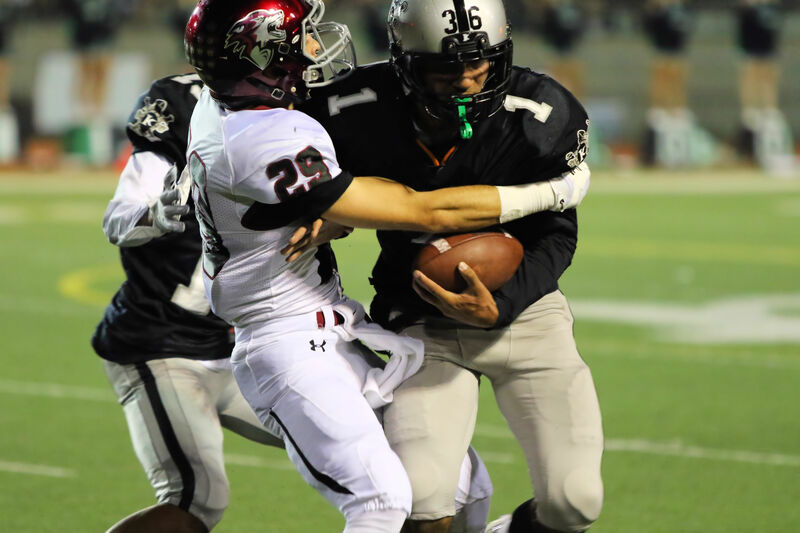 The Conks moved the ball down the field until the drive came to a halt when Max Gardiner intercepted a pass in the end zone, ensuring that the Wolves would have a shutout. The Wolves offense worked the clock and after a few plays the clock wound down to zero. 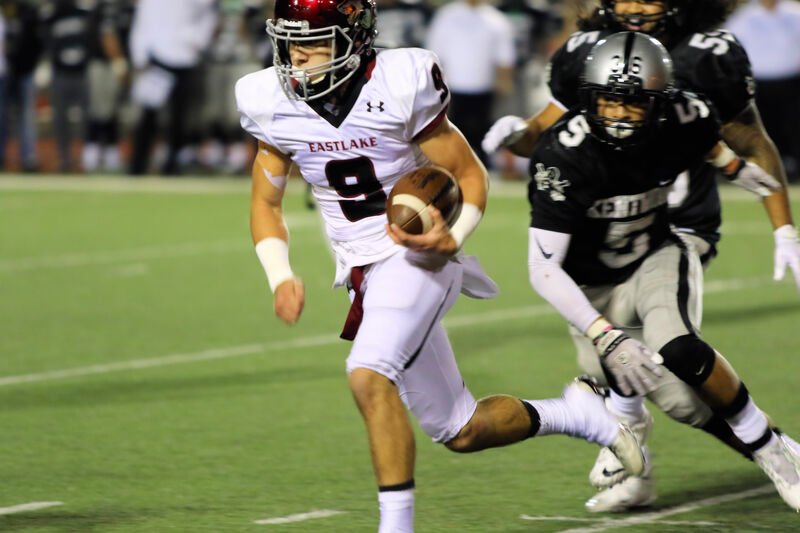 We look forward to seeing everyone at Eastlake Stadium to watch the Wolves take on the Skyline Spartans (ranked 10th in the state) for the second round of the playoffs. The Wolves are pumped and ready to avenge their loss to the Spartans by just 3 points earlier in the season.